Was there any discussion of silk long-johns? Can't see 'em, but they definitely help. It's clearly a stellar find! I will email F21's publicist and find out when it will be re-stocked. Will keep you posted. Oddly enough, yesterday afternoon, I bought one at The Westfield Topanga shopping mall! I saw two more L/G sizes in the store. I was pretty amazed to find the parka on Le Catch this morning! Love it. Heartbreakingly gone! Do let us know if you find another equally adorable one out there. Is the same price range too much to ask?! Hopefully they restock the parka! I've been looking for nice black straight jeans. Can anyone tell me how topshop sizing is...I'm normally a 27, and I see that my option with these is 26 or 28. Hey all! Wanted to share that I found a similar one on F21 site under their Love21 contemporary collection... $42.80 (approx?). Not EXACTLY the same and quite frankly not as good, but very similar and worth it for the low price. I would go up a size and try the 28. Yes, please let us know when/if it comes back in stock or whether there are similar ones in this price point. I checked out the F21 Love21 but one of the reviews says it's thin and not warm, which sort of negates the point for me. 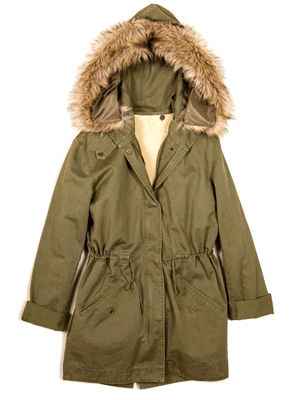 I've been dying for a parka like this for years but just haven't found the right one!